Transportation and Arbitration: A Love Story? 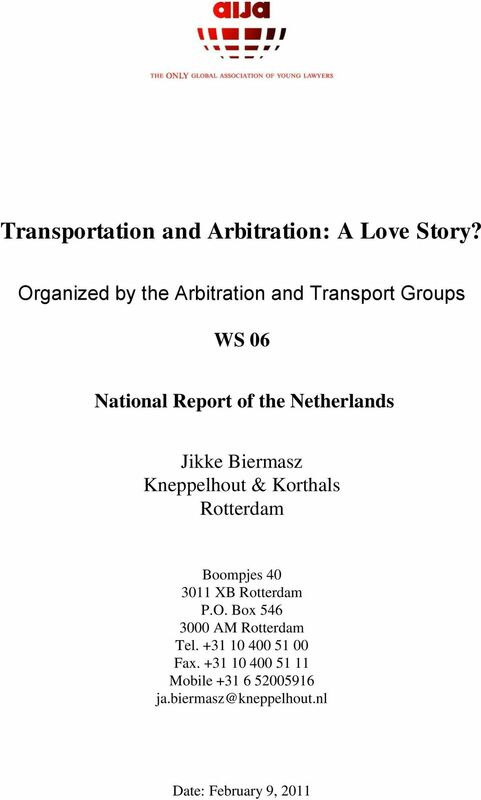 Download "Transportation and Arbitration: A Love Story?" 2 2/6 1. WHAT IS THE DOMESTIC LAW OR REGULATION WHICH GOVERNS MARITIME ARBITRATION? Rules with respect to arbitrations within the Netherlands and arbitrations abroad are laid down in the first respectively second title of the fourth book of the Dutch Code of Civil Proceedings ( DCCP ) titled Arbitrage (the articles 1020 up to and including 1073 DCCP respectively the articles 1074 up to and including 1076 DCCP). 2. IS YOUR JURISDICTION A SIGNATORY TO THE NEW YORK CONVENTION? Yes, the Netherlands has ratified the New York Convention on 24 April The Convention has entered into force for the Netherlands on 23 July IS THERE AN ACTIVE MARITIME ORGANIZATION IN YOUR JURISDICTION? A.) IF SO, WHAT IS IT? B.) DO THEY HAVE SEPARATE ARBITRATION RULES? The foundation TAMARA (Transport And Maritime Arbitration Rotterdam-Amsterdam) is the most important maritime arbitration body in the Netherlands. Since it was established in 1988 the TAMARA foundation has offered a platform for conducting professional arbitration proceedings in the areas of shipping, shipbuilding, transport, storage, logistics and international trade. Arbitration proceedings are conducted according to the arbitration rules of TAMARA. These rules are published on the website of the TAMARA: (available in English). Furthermore, there is the Netherlands Association for Forwarding and Logistics (FENEX). This is a branch organisation for the freight forwarding sector with almost 400 members. The FENEX has a permanent arbitration tribunal since 1934, which settles disputes between freight forwarders and their customers on grounds of the Dutch Forwarding Conditions, Dutch Warehousing Conditions and the Terms and Conditions for Value Added Services (VAL) of the FENEX. The FENEX recommends to follow its Procedure of Arbitration which can be found on the website (also available in English). Although not specific for the maritime sector, worth mentioning is also the Netherlands Arbitration Institute established in 1949 ( NAI ). As an independent foundation the NAI aims to promote the resolution and settlement of disputes by means of arbitration, binding advice and mediation and offers effective arbitration proceedings. The NAI has published Arbitration Rules. The website is (also available in english). The NAI does not deliver arbitral awards itself but has a list of expert arbitrators who can be assigned on a case-to-case basis. 3 3/6 4. WHAT ARE THE ADMINISTRATIVE FEES AND ARBITRATION COSTS UNDER THE APPLICABLE ARBITRATION RULES IN YOUR JURISDICTION? The costs of a TAMARA arbitration are laid down in Rule XIV. The arbitrators have declared themselves prepared to work for these fees in arbitration proceedings under the TAMARA Rules. The administration costs and hourly fees depend on the financial interest of the claim. The schedule is published on the website. The administration costs of a FENEX arbitration amount 200,- if one of the parties is a member and 400,- if neither party is a member. Apart from the administration costs, a fee will be charged for the time the arbitrators spend the arbitration. In this connection, the arbitrators require that a deposit will be paid at the commencement of the procedure as an advance on arbitration costs. The NAI does not give a detailed cost estimate in advance. The total costs of the arbitration proceedings comprise the following elements: fees and costs of the arbitrator(s), an administration fee which differs relative to the financial interest of the matter and of course the costs of legal assistance (which is not compulsory). 5. ARE THERE ANY SPECIFIC FORMAL REQUIREMENTS FOR DRAFTING ARBITRATION CLAUSES IN YOUR JURISDICTION? No, in principle there are no specific formal requirements under Dutch law. Parties can even agree on arbitration verbally; the agreement is a consensual contract. However, although a written (or signed) arbitration agreement or clause is not a formal requirement, article 1021 DCCP prescribes that an arbitration agreement is proved by a document. Therefore, in case the arbitration agreement or clause is challenged (in time) by the other party, the agreement has to be proven by a document. For that purpose a document which contains a provision for arbitration or which refers to general terms and conditions which provide for arbitration and which has been accepted explicitly or tacitly by the other party, is sufficient. In general there are no requirements with respect to the contents of the arbitration agreement or clause other than those which arise from the essentials of this type of contract. In this respect article 1020 paragraph 1 DCCP prescribes that the agreement has to refer to disputes, which have arisen of which could arise, between the parties from certain legal relationships, whether contractual or not. Therefore the parties have to specify the legal relationship. A general arbitration clause is not valid. 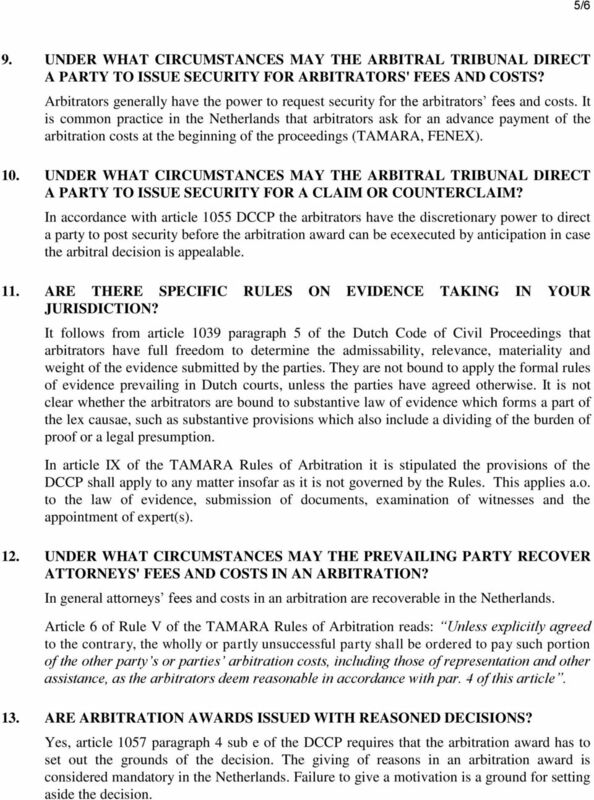 TAMARA recommends the following clauses for TAMARA arbitrations: "Any dispute arising out of or in connection with this agreement shall be referred to Arbitration in Rotterdam in accordance with the TAMARA Arbitration Rules (available at the Rotterdam Chamber of Commerce, Information Department and at the TAMARA foundation, P.O. Box 23158, 3001 KD Rotterdam / or "Any dispute arising out of or in connection with this agreement shall be referred to Arbitration in Rotterdam in accordance with the TAMARA Arbitration Rules"
4 4/6 The FENEX has included an arbitration clause in its general conditions. The NAI advises the following clause for arbitrations under its rules: "All disputes arising in connection with the present contract, or further contracts resulting therefrom, shall be finally settled in accordance with the Arbitration Rules of the Netherlands Arbitration Institute." Under article 2 paragraph 2 of the New York Convention, an arbitration agreement must be in writing, signed by the parties or contained in an exchange of letters or telegrams. 6. UNDER WHAT CIRCUMSTANCES CAN AN ARBITRATION CLAUSE BE (DEEMED) INCORPORATED BY REFERENCE? Article 1021 DCCP prescribes that an arbitration agreement is proved by a document and that a document which refers to general conditions which provide for arbitration and which has been accepted by or on behalf of the other party explicily or tacitly, is sufficient in this respect. 7. UNDER WHAT CIRCUMSTANCES CAN THIRD PARTIES BE BOUND TO AN ARBITRATION CLAUSE? Under Dutch law in principle only the parties to an arbitration agreement are bound to this agreement. However, there are exceptions to this basic principle of contract law and sometimes third parties are bound to an arbitration agreement as well. In general contract law this applies to the joint and several debtor and the assignee. Futhermore, third parties are bound in case of legal concepts as subrogation, acceptance of a third party clause, takeover of a debt or a contract. Within the scope of maritime law it follows from article 8:441 paragraph 2 of the Dutch Civil Code ( DCC ) that the carrier and the holder of a bill of lading who was not also the consignor can reciprocaly invoke an arbitration clause in the bill of lading. 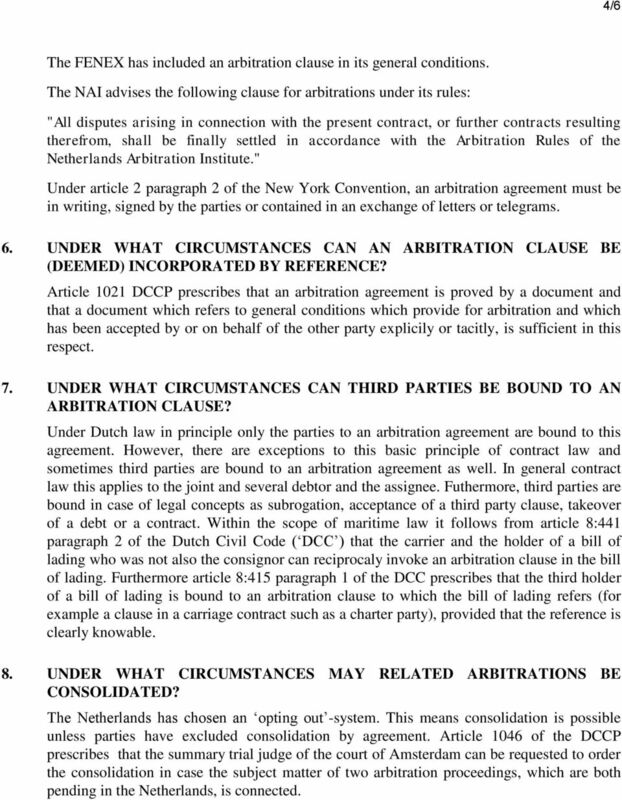 Furthermore article 8:415 paragraph 1 of the DCC prescribes that the third holder of a bill of lading is bound to an arbitration clause to which the bill of lading refers (for example a clause in a carriage contract such as a charter party), provided that the reference is clearly knowable. 8. UNDER WHAT CIRCUMSTANCES MAY RELATED ARBITRATIONS BE CONSOLIDATED? The Netherlands has chosen an opting out -system. This means consolidation is possible unless parties have excluded consolidation by agreement. Article 1046 of the DCCP prescribes that the summary trial judge of the court of Amsterdam can be requested to order the consolidation in case the subject matter of two arbitration proceedings, which are both pending in the Netherlands, is connected. 5 5/6 9. UNDER WHAT CIRCUMSTANCES MAY THE ARBITRAL TRIBUNAL DIRECT A PARTY TO ISSUE SECURITY FOR ARBITRATORS' FEES AND COSTS? Arbitrators generally have the power to request security for the arbitrators fees and costs. 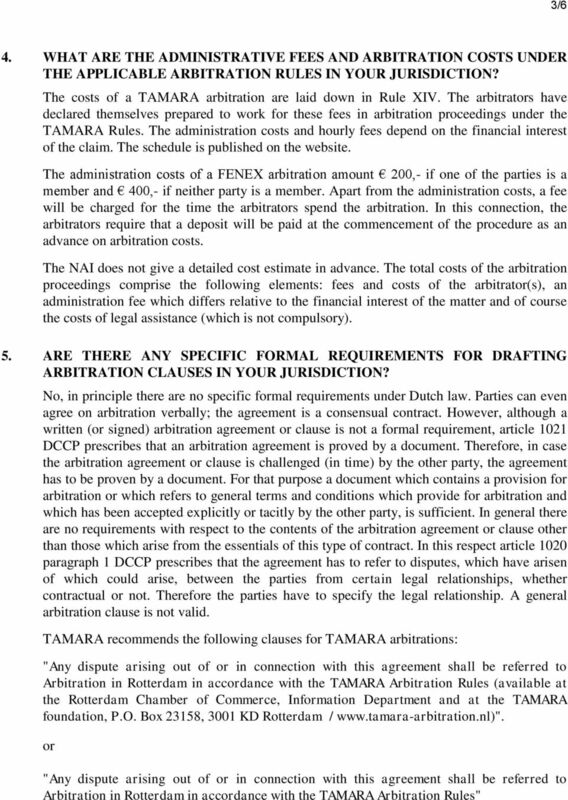 It is common practice in the Netherlands that arbitrators ask for an advance payment of the arbitration costs at the beginning of the proceedings (TAMARA, FENEX). 10. UNDER WHAT CIRCUMSTANCES MAY THE ARBITRAL TRIBUNAL DIRECT A PARTY TO ISSUE SECURITY FOR A CLAIM OR COUNTERCLAIM? In accordance with article 1055 DCCP the arbitrators have the discretionary power to direct a party to post security before the arbitration award can be ecexecuted by anticipation in case the arbitral decision is appealable. 11. ARE THERE SPECIFIC RULES ON EVIDENCE TAKING IN YOUR JURISDICTION? It follows from article 1039 paragraph 5 of the Dutch Code of Civil Proceedings that arbitrators have full freedom to determine the admissability, relevance, materiality and weight of the evidence submitted by the parties. They are not bound to apply the formal rules of evidence prevailing in Dutch courts, unless the parties have agreed otherwise. It is not clear whether the arbitrators are bound to substantive law of evidence which forms a part of the lex causae, such as substantive provisions which also include a dividing of the burden of proof or a legal presumption. In article IX of the TAMARA Rules of Arbitration it is stipulated the provisions of the DCCP shall apply to any matter insofar as it is not governed by the Rules. This applies a.o. to the law of evidence, submission of documents, examination of witnesses and the appointment of expert(s). 12. UNDER WHAT CIRCUMSTANCES MAY THE PREVAILING PARTY RECOVER ATTORNEYS' FEES AND COSTS IN AN ARBITRATION? In general attorneys fees and costs in an arbitration are recoverable in the Netherlands. Article 6 of Rule V of the TAMARA Rules of Arbitration reads: Unless explicitly agreed to the contrary, the wholly or partly unsuccessful party shall be ordered to pay such portion of the other party s or parties arbitration costs, including those of representation and other assistance, as the arbitrators deem reasonable in accordance with par. 4 of this article. 13. ARE ARBITRATION AWARDS ISSUED WITH REASONED DECISIONS? Yes, article 1057 paragraph 4 sub e of the DCCP requires that the arbitration award has to set out the grounds of the decision. The giving of reasons in an arbitration award is considered mandatory in the Netherlands. Failure to give a motivation is a ground for setting aside the decision. 6 6/6 14. UNDER WHAT CIRCUMSTANCES CAN ARBITRATION AWARDS REMAIN CONFIDENTIAL OR/AND BE PUBLISHED? It is assumed that arbitration proceedings are not public. However, in general arbitration institutes reserve the right to publish (an anonymous version of) the arbitral decision. 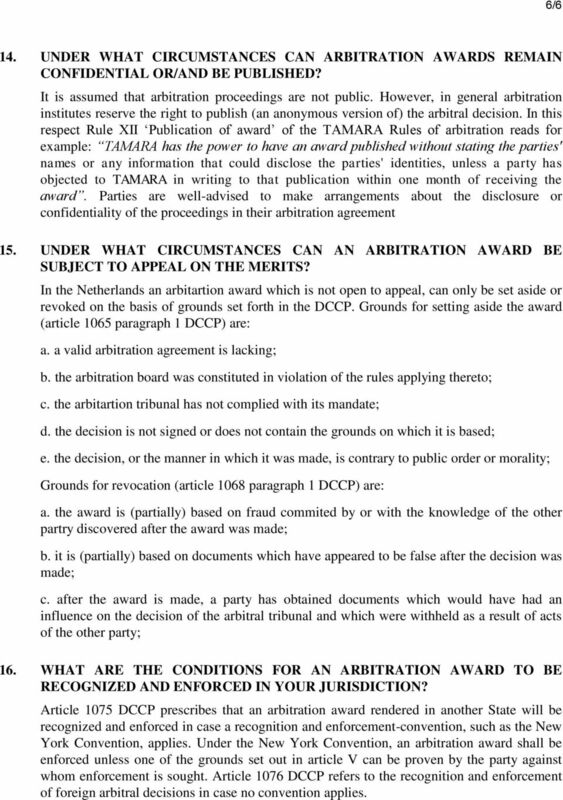 In this respect Rule XII Publication of award of the TAMARA Rules of arbitration reads for example: TAMARA has the power to have an award published without stating the parties' names or any information that could disclose the parties' identities, unless a party has objected to TAMARA in writing to that publication within one month of receiving the award. Parties are well-advised to make arrangements about the disclosure or confidentiality of the proceedings in their arbitration agreement 15. UNDER WHAT CIRCUMSTANCES CAN AN ARBITRATION AWARD BE SUBJECT TO APPEAL ON THE MERITS? In the Netherlands an arbitartion award which is not open to appeal, can only be set aside or revoked on the basis of grounds set forth in the DCCP. Grounds for setting aside the award (article 1065 paragraph 1 DCCP) are: a. a valid arbitration agreement is lacking; b. the arbitration board was constituted in violation of the rules applying thereto; c. the arbitartion tribunal has not complied with its mandate; d. the decision is not signed or does not contain the grounds on which it is based; e. the decision, or the manner in which it was made, is contrary to public order or morality; Grounds for revocation (article 1068 paragraph 1 DCCP) are: a. the award is (partially) based on fraud commited by or with the knowledge of the other partry discovered after the award was made; b. it is (partially) based on documents which have appeared to be false after the decision was made; c. after the award is made, a party has obtained documents which would have had an influence on the decision of the arbitral tribunal and which were withheld as a result of acts of the other party; 16. WHAT ARE THE CONDITIONS FOR AN ARBITRATION AWARD TO BE RECOGNIZED AND ENFORCED IN YOUR JURISDICTION? Article 1075 DCCP prescribes that an arbitration award rendered in another State will be recognized and enforced in case a recognition and enforcement-convention, such as the New York Convention, applies. Under the New York Convention, an arbitration award shall be enforced unless one of the grounds set out in article V can be proven by the party against whom enforcement is sought. Article 1076 DCCP refers to the recognition and enforcement of foreign arbitral decisions in case no convention applies. This innovative Scheme has been developed to resolve small claims disputes within the maritime industry. A new Danish Arbitration Act came into force on 1 July 2005. It is largely based on the UNCITRAL model law. Domain Name Dispute Resolution Copyright 2011 Supreme Council of Information and Communication Technology (ictqatar) Table of Contents 1. Definitions... 4 2. Purpose... 4 3. Your Representations... 5 4.